Off on the Ferry to Gravesend today for the Cambria Trust Annual General Meeting, held at the Port of London Authority headquarters at London River House. The Cambria Trust, of course, owns and maintains the sailing barge Cambria, renowned as the last UK registered vessel to trade under sail alone. A wooden Thames sailing barge, she still has no engine and is completely dependent on the wind. The AGM was well attended, and it was good to see a number of people who had not met since last year’s meeting. Chairman, Bruce Richardson, reported on a busy year with charters by Rotary International District 1120 and the Sea-Change Sailing Trust, both using the barge for sail training. Cambria had taken part in several of the annual barge matches, doing well, and had been at the Classic Boat Festival in St Katharine’s Dock in September, where on several days she had welcomed 1,000 visitors. A highlight of the day was the presentation to the Trust of a splendid framed picture of Cambria taking part in the Thames Match of 1936. The picture was a gift to the Trust from Tony and Sandy Farnham, and in handing it over Tony said that he hoped the picture would be installed on board the barge. 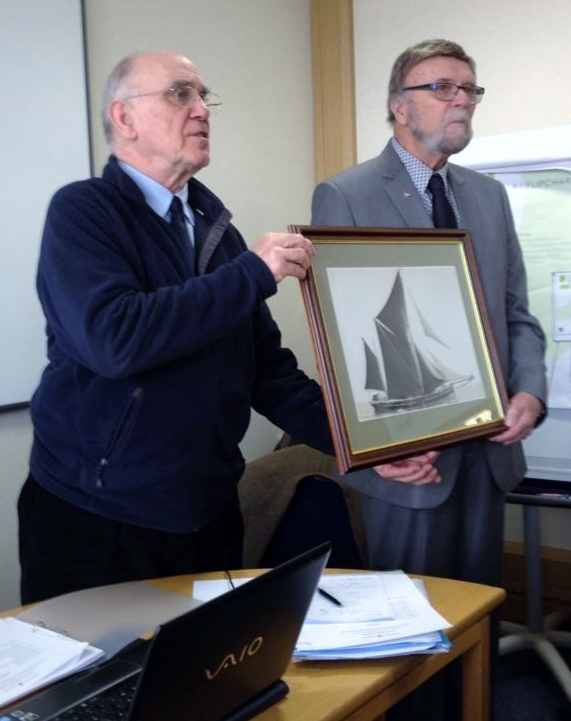 Our picture shows Tony Farnham, right, presenting the picture to Bruce Richardson. Posted on 21/02/2015, in Barge People, Cambria Trust, sb Cambria and tagged Bruce Richardson, Cambria Trust, Classic Boat Festival, Gravesend, PLA, Rotary International, Sea Change Sailing Trust, St Katharine's Dock, Tony Farnham. Bookmark the permalink. Leave a comment.